My last two blog posts for ActiveHistoy.ca deconstructed pre- and post-Confederation Canadian history in children’s books. My findings suggested that stories that explored difficult histories or social justice topics often did not connect these stories to larger national forces and thus felt isolated from the rest of Canadian history. These findings suggest a dangerous separation. Historians, teachers, and intellectuals can scoff at an add-and-stir or drag-and-drop approach to teaching and learning Canadian histories, but this pattern of seeing some histories as the primary subject of history and other histories are secondary is a pattern that begins early in one’s understanding of national literacy. May is Asian Heritage Month in Canada. 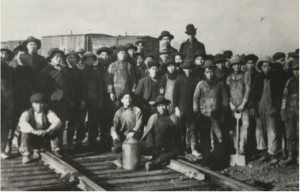 This month my focus is on the labour of Chinese men in building the railroad. In looking for and reading children’s books on this topic, I question: Are there books for children representing this history? Did this history connect to other national (or local or global) events? Was injustice featured or was it mentioned as a corollary to the bigger picture? Thus, I began my research for this post on Chinese railroad labourers by searching the Toronto Public Library. 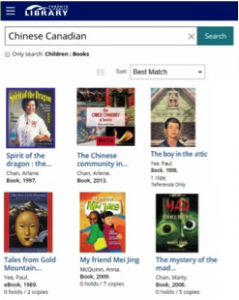 While I wanted to see if I could find children’s picture books on Chinese labourers building the railroad, my previous searches have taught me that the words I expect to search with are not always the ones that turn up results; so I began my search by being more generic and entering key words such as “Chinese Canadians” and “railroad” into the database rather than the more specific “Chinese workers + railroad.” What this meant was that my results would now cover general Chinese Canadian history and the general history of the railroad, rather than the combination of both topics. But maybe that was ok. Maybe being broader in my search was a better strategy to find the books that parents and children were using for this topic. To my surprise, there were plenty of hits – for both the railroad and also for Chinese Canadian history. This was really encouraging, but also confusing. Why do some Canadian history topics have a plethora of children’s books covering them and other topics have few, or none? I found that most of these books were non-fiction rather than fiction and were for older readers aged 10 to 12 rather than the under-8s I was originally interested in writing about. In my search I found three books that focused primarily on the experiences of Chinese labourers: Yip Sang, Canadian Pacific Railway, and Blood and Iron. Each book followed a similar narrative structure in that they all featured the story of one man situated in larger national and global narratives – events in China and North America precipitated migration and the post-railroad period of settlement in Canada. While the books were text heavy, all three books featured archival photographs illustrating real events and/or people. Exploitive labour was part of these stories, but didn’t constitute them. Yip Sang, for example only had one chapter out of nine on building the railway, with the majority of the chapters in this non-fiction book on post-railway life. The impression leaving these books was that they narrated the early years of being a Canadian of Chinese ancestry, not of an exploited and temporary workforce. By searching just for books on the railroad, I found more books that were varied in terms of reader accessibility, length, and text-to-image ratio. The Last Spike in the CPR is a short comic book-like text featuring reproductions of the famous “last spike” photograph, Pierre Berton’s Steel Across the Shield is a non-fiction chapter book with hand drawn maps by Paul McCusker, and a book from the classic Kids Book of Canada series, Railway and How the CPR was Built, featuring two page topical explorations of various elements of the railway. Most of these books are part of a series on Canadian history, like Canadian History Timelines or Early Canadian Life or The Dreadful Truth. With these books there is a clear indication of the place of the railroad in the development of Canadian history. How does the labour of Chinese men fit into these histories? For the most part all of the books acknowledge Chinese labour as a part of the building the railway, but by and large, these labourers are featured as a group of nameless and passive actors in a larger theatre of national progress and development. In some cases, the greatest consistent acknowledgment of this labour were background illustrations that featured Asian labourers, even when the text was not about them directly. Many books acknowledged the low wages and poor living and working conditions of the labourers, but without the weight of racist or imperialistic thinking. One book even rationalized poor treatment as being the fault of labourers themselves, saying that: “The Chinese were often mistreated by other workers, in part because the Chinese agreed to work for lower wages” (The Last Spike in the CPR). From Gordon Lightfoot Canadian Railroad Trilogy. Illustrations by Ian Wallace. In these books on the railroad, there was no sense of permanence to the lives of the labourers in Canada nor a sense of agency by the labourers themselves – images of another “home” haunted the imagery. The development of the railroad is lauded throughout all of these books and some things, like the displacement of First Nations, the Red River Rebellion, and the exploitation of Chinese labour, were just a part of these accomplishments. While Christopher Dummit is correct in his assertion that many Canadians celebrate Canadian history despite, or in spite of, past wrong, it is not to say that we cannot still explore these wrongs and hold their legacy to account for today. Canada’s long history of racism, imperialism, and colonialism continues to have an effect on Canadians and we, as Canadians, have a responsibility to understand how we fit into this history so that we may move into a more equitable vision for the future. Men like Dukesang Wong (featured in The Boy in the Picture) and Yip Sang, as well as the family of Pon Git Cheng (featured in Canadian Pacific Railway), all built a home for themselves in Canada after the railroad was complete. However, over and over people of colour in Canada are perceived as being “really from” a place other than Canada, whereas “where are you really from?” is not a question White Canadians (often) have posed to them. This is because the logic of White supremacy was unabashedly built into our national development and our telling of national stories. 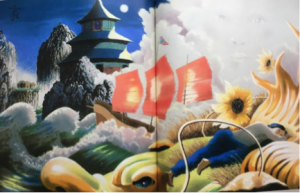 While we can’t change our history, as 21st century Canadians, we have a responsibility to acknowledge the inequity built into our cultural texts and, even in children’s books, demand more multilayered stories as the stories that make up Canada. If you’ll be at Congress this year, catch my talk at the CHA on the representation of Confederation in children’s books. I’ll also be posting a condensed version of my finding on ActiveHistory.ca in June. As always, any book recommendations are appreciated!